On Saturday, February 14, 2015, at the San Francisco Writers Conference, Gennifer Choldenko will speak at the special event that is free and open to the public. The conference is held at the Mark Hopkins Hotel and the event is at 3:00 to 3:45. Seating is limited so reservations are required. The session is geared to students in the 5th to 8th grade, but all of Gennifer’s fans are encouraged to attend. Children must be accompanied by a parent or adult, or one adult may accompany up to 10 children. There will be book-signing and selfies with Gennifer after the session. Kate Farrell, president of Women’s National Book Association, is the Youth Event Coordinator. Choldenko is the author of the bestselling middle-grade Al Capone trilogy. She will discuss life on The Rock and her books: Al Capone Does My Shirts, Al Capone Shines My Shoes, and Al Capone Does My Homework. 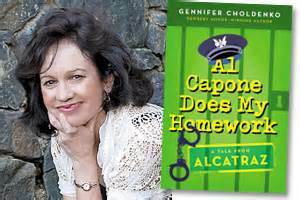 She got the idea for the first book in the series, Al Capone Does My Shirts, when she read an article in the newspaper about kids who grew up on Alcatraz. The children were sons and daughters of the guards who worked in the cell house where some of the most notorious criminals were held. She signed up to work as a docent on Alcatraz. She roamed the island imagining how it would feel to grow up there. She interviewed Alcatraz previous residents and researched books before and during the writing of the book. Al Capone’s first job on Alcatraz was working the mangle in the laundry facility. 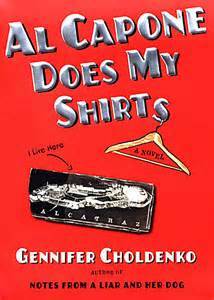 Choldenko imagined a kid living on Alcatraz telling his friends “Al Capone does my shirts.” When I was tutoring students from Indonesia, we read Choldenko’s first book together and I enjoyed the characters, the humor, and the setting. I’m looking forward to meeting her at the conference and reading her other two books in the series.